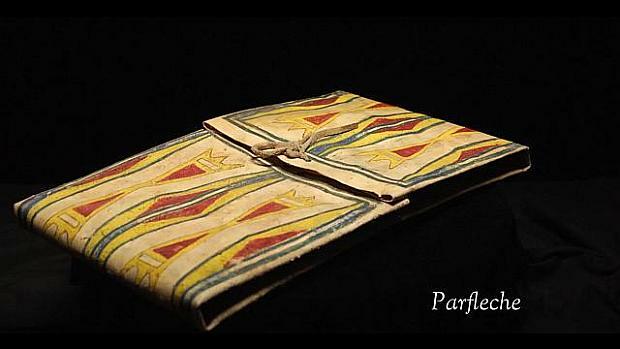 This item is called a parfleche. They were used to pack things away for transport or for storage and were used as containers for such things as dried meat and other dried foods as well as personal items such as clothing or medicinal items. The meat was stored in these bags and the meat was able to be transported and would stay nourishing for long periods of time. They are compared to suitcases or handbags and are made from animal skins like deer and elk. The hide is soaked for a week or so and the hair is removed and then the hide is stretched. The red color designates the Indian, the green is for the vegetation around us like trees, and the black is for nighttime. The color combinations and designs were used to relate information like stories or aspirations for the person the item was given to. People could read them and tell a history of things like family events or tribal migrations. We have lost the way of reading these and the system of carrying messages.